When I first heard that Youth Rights Media would have 28 teenagers participating in our summer institute program, my reaction was similar to the rest of the staff: “What. Wait, what?” 28 is a big number! But after the first week I have to say it’s going very well. Youth Rights Media, as I’ve said before, is an non-profit organization that runs an after-school program for youth in New Haven to learn community organizing, media literacy and production skills. It was created with the intention of empowering youth to better understand their rights and raise awareness on those issues, specifically in encounters with police. In the past few years the youth in the program have produced documentaries on gun violence, the “school to prison pipeline,” and youth jobs, as well as a host of other issues relevant to their community. During the school year, things run pretty normally. In the summertime, we condense the program into a five-week exercise that takes kids, gives them a crash course in all the issues we deal with (community organizing & advocacy, video skills, critical thinking), and ask them to come up with a short project or product that addresses something important to them. This year, our goal is to get them to produce short videos or video blogs on the topics they care about. Interns from YRM trying to figure out how they can all stand on the box in the middle. Last week was the first week of the program. The first few days are when people are getting to know each other, how to work together, and whether or not things will really go well for any program. 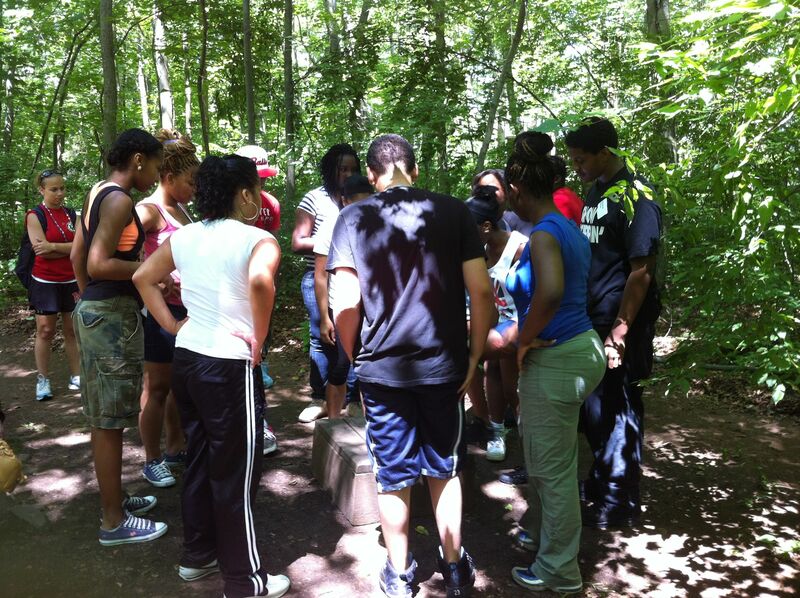 I have to say the youth did great at a “ropes course” in Meriden, where they have to collectively overcome a series of obstacles. Some of them were a little more difficult than others, but by the end of the day they learned how important it was to communicate to achieve those goals! Because of the July 4th holiday, we only had three days this first week (typically the program is four days out of the week). 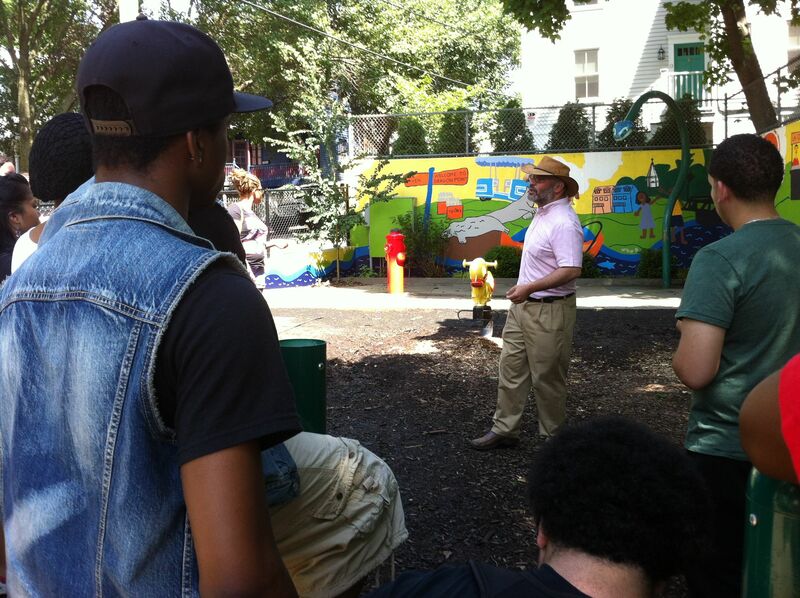 The first day was mostly orientation, the second day was our ropes course, and the third day, we went on a walking tour of Fair Haven with Lee Cruz, the community outreach director at The Community Foundation for Greater New Haven. Lee took the kids on a trip around the neighborhood, point out places and things that were changed by kids and adults who were members of the community and decided to do something about the problems they saw. We saw a nice local park that had been a place where people did drugs and prostitutes solicited, which residents decided to organize together and clean up. As we walked through the area, we saw community gardens and playgrounds, a little-free-library-box (akin to what others have done in other parts of the country) , and people came out on their porches to wave to Lee, asking him what we were doing. This was part of our goal to engage the youth in community mapping. When we came back to the office, we heard from Johnny Scafidi of Dwight Hall at Yale, who talked to us a little about the history and demographics of New Haven. He illustrated the problem of the “two Connecticuts,” income disparity and other issues that divide the state between the popular conception of affluent, suburban extensions of Westchester County and the reality of Hartford, Bridgeport and New Haven as places with important economic and social issues to address. This is something I’ve worked a little on in the past – particularly Yale versus New Haven vis-à-vis Washington versus D.C. In my experience, the interns of Youth Rights Media are acutely aware of media perceptions of New Haven, and to a lesser extent, Connecticut. The way they clash, with images of “typical” inner city violence on the news versus programs like the Gilmour Girls, only heighten the divide between the cities and the suburbs. I recognized much of Scafidi’s talk as being influenced by Douglas Rae’s book, City. Several years ago I was fortunate enough to participate in a class at Yale in which we used the book and discussed the issues of urban renewal and new urbanism. That experience resonated with me. I was a student at Gateway Community College, and the stark contrast between the students who bussed in from Long Wharf and the Yalies very clear; those issues had an even stronger meaning, which instilled an early sense of class consciousness in me. It’s the sort of thing our interns experience, but without access to those places where the divisions become even more clear. Later this week I’ll be talking to the youth about civic media and media literacy, giving them a (very) quick introduction to those ideas. I’m planning on utilizing some materials produced by Anita Sarkeesian to illustrate gender roles as defined by media. Unfortunately we won’t have much time to deconstruct anything entirely, but I’m looking forward to a (hopefully) good discussion! I also want to introduce civic media as encompassing the practices of citizen journalism, participatory media, “grassroots” activism and advocacy, and give them the opportunity to create a concept that addresses an issue that affects them. This is similar to what I got to do with other grad students and professionals during the Paper Tiger Conference last year, but I’m expecting slightly more practical results from the teenagers! This entry was posted in Media Studies general, production and tagged civic media, Douglas Rae, Johnny Scafidi, Lee Cruz, media literacy, two connecticuts, Youth Rights Media. Bookmark the permalink.